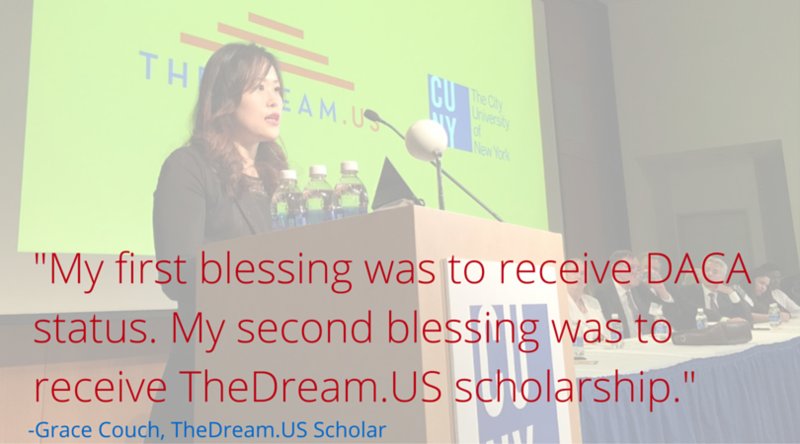 On May 5, 2015, CUNY hosted a Chancellor’s Reception for TheDream.US scholarship recipients. Among the three DREAMer speakers of the evening was 29-year-old Grace Couch, currently in the Nursing program at Hunter College, who spoke about her journey as an undocumented student and what inspires her career goals. Thank you so much, Senior Vice Chancellor Hershenson, for introducing me and moderating this event. Before I speak I would like to also thank TheDream.US scholarship for making everything possible for my colleagues and me, especially Mr. Donald Graham and Ms. Amanda Bennett, who are co-founders of this scholarship. I want to give special thanks to Mr. Cristobal Aviles for his tireless work as an advisor and mentor for the scholars at Hunter College. Thank you so much, Chancellor Milliken, for believing in TheDreamUS.scholarship and pushing so hard to make it available for us so that undocumented students have an opportunity to reach our goals and dreams. I also want to express my appreciation to Hunter’s President, Jennifer Raab and Vice President, Eija Ayravainen, for their limitless support of our Hunter TheDream.US Scholars. Hello everyone. I am honored to represent the Fall 2014 round of TheDream.US scholars and to be addressing everyone this evening. My name is Grace Couch. I was born in South Korea. My family decided to move to the United States when I was 8 years old because raising and educating three children in Korea was very difficult. South Korea is such a small country that there are limited opportunities to fulfill one’s dreams. My parents knew there would be more opportunities for my siblings and me by moving to the United States. Once we got here, my dad made arrangements with one of our distant relatives to start our immigration process. He promised he would help us get our permanent residency through a church organization but then disappeared with most of my parents’ savings. Returning to Korea was not an option, so our family has been living in the United States ever since. I remember when I was younger, my parents told me I had to be a good girl because if I ever got into trouble with the police, I would be deported. I had a happy childhood with my loving parents and siblings, but in the back of my mind, I was always afraid of getting kicked out of the country. The United States has been my country since I was eight years old. I have not visited Korea in over 20 years and while I was furious to find out the MTA raised the fare to $2.75, your guess is as good as mine as to how much it costs to ride the train in Korea. When I graduated from Stuyvesant High School, one of the best public high schools in New York, applying to college was one big disappointment after another. I was not eligible for any financial aid or even private loans. All my friends were wondering if they should go to NYU or wait out the Columbia waitlist. Meanwhile, I was wondering if I would be able to afford to go to a college at all. Even if I did, who would hire me without working papers? There was no future for me, so what was the point of studying? Despite my discouragement, I went to City College. I vaguely thought I wanted to work in the healthcare field, so I studied Biology because the human body and genetics fascinated me. One day, I was told that I had to fill out a FAFSA form in order to receive my National Merit Scholarship. I had to explain that I was an illegal immigrant so I could not fill out the form. It was a mortifying experience. I thought to myself, this is it. I will have to drop out of college. I kept thinking, “Why? Why don’t you want me? You’re the only country I have.” A wonderful advisor helped me retain the scholarship after all. Unfortunately, other financial difficulties arose and I had to start working full-time, which did not allow me to complete my degree at City College. I felt completely defeated. I worked for few years and after a particularly exhausting day, I got off the train and found myself in the midst of several medical offices. Something rekindled inside of me! So what if I was undocumented? Things will not change if I wallow in self-pity and do nothing. Shortly after, I applied to Queensborough Community College Nursing School while I waited for my DACA application to be processed, and was accepted. I had great experiences with my professors. Nursing has been unlike anything I ever experienced. The first clinical rotation was at St. Alban’s Veterans Affairs Healthcare System. The first words I heard when I stepped into the unit were, “look, the angels are here.” I felt embarrassed, but it also felt good because I now had the power to help other people, not just need help for myself. The patient who was assigned to me was a veteran who served in the Korean War. What are the chances that I would meet a Korean Veteran on my first day at the clinic? It was such an emotional moment for me because this gentleman served both of my countries—The United States and Korea — and now I had the privilege to repay him. At that moment, it felt like nursing was my destiny. I really like nursing because most often we spend the most time with the patients and usually have the most impact on their experience. One of the primary roles of a nurse is that we advocate for and empower our patients. With the large healthcare gap minorities face in the US, it is such a rewarding experience to be able to help bridge some of these disparities through my education, professionalism, and care. Simple things, such as using the phone interpreting services to communicate with my patients, helped eliminate some of the cultural and language barriers so many face in an unfamiliar and daunting hospital environment. I transferred to Hunter through the RN to BSN bridge program from Queensborough. The nursing professors are the greatest role models in my life. They are passionate, caring, professional, and they never stop pursuing greatness. They work as nurses, teach as professors, and study as PhD candidates all at once. They make me think, “Wow, they are so awesome. I want to be just like them! I never want to stop pursuing higher and higher goals!” My professors at Queensborough shaped me to be a proficient clinical nurse, and my professors at Hunter College are now training me to be a culturally sensitive, research proficient and well-rounded nurse. Studying has never been so much fun. My first blessing was to receive the DACA status. My second blessing was to receive TheDream.US scholarship. It really feels surreal. My life has changed so much in the past three years. I no longer have to juggle working five days a week as a full-time receptionist, working the weekend as a waitress, and attending microbiology class in the evenings. This schedule only lasted two months and it definitely was not one of my best ideas. I can focus on studying so that my patients can receive the best care that I can provide. 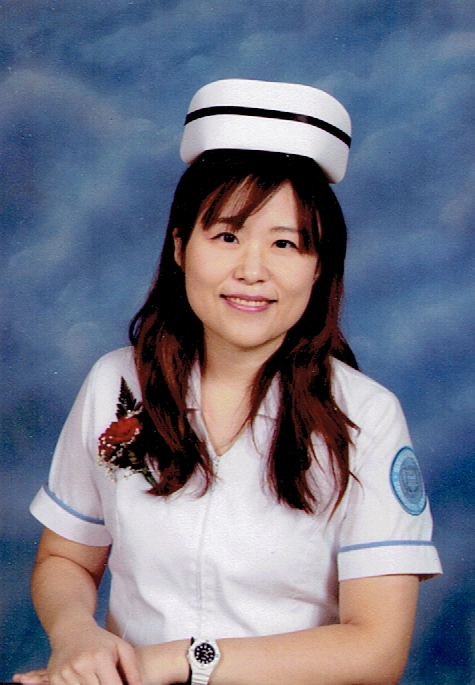 I am planning to follow my professors’ footsteps in obtaining my masters and eventually a PhD in nursing. I want to become a nurse educator and a leader to speak up for our immigrant and minority populations. From a scared undocumented student living in the shadows, I became a confident registered nurse with so many opportunities and doors open.